If you’ve been searching for the perfect personalized money clip, you’ve stumbled on the right place! 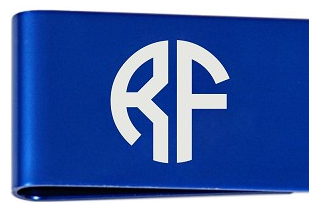 We have a great selection of money clips, perfect for birthday, groomsmen, or holiday gifts. An engraved money clip is a great way to keep your money organized with a classy look and a personalized touch. Whether customized with a monogram, design, or personal message, our selection of products with custom engravings will make your gift shopping easy, no matter what the occasion! A personalized money clip that will be used as a convenient way to keep money safe and secure in a pocket or keep a wallet well organized. With a custom message, an engraved money clip also becomes a thoughtful gift for anyone. A traditional piece with an updated design will be appreciated and used over and over again. Great for groomsmen gifts, tokens of appreciation or birthday presents, money clips are ideal for any guy at any age. At Frederick Engraving, we offer custom engraving and personalization on all kinds of products, making shopping easy for you. Professional engraving adds that extra special touch to all kinds of items, showing your recipient that you care and took the time to think about them when buying them something special. Our inventory, pricing, and turnaround time rivals any mall shop or kiosk and delivers a personalized touch right to your door. Browse our selection of products any time, including personalized money clips and more, to find the ideal gift for anyone you’re shopping for! Shop Personalized Money Clip Now!